Stimulating and energising. 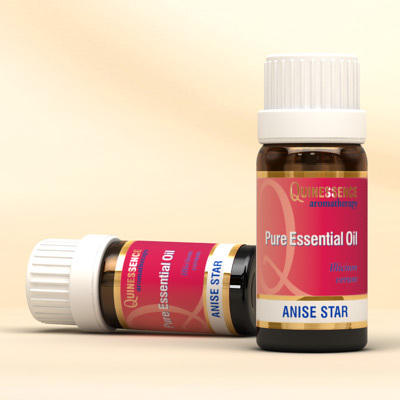 The sweet and herbaceous smell of Anise Star essential oil is reminiscent of aniseed or liquorice, and has a refreshing and stimulating action on the digestive system and muscles when used in massage. Star Anise oil is an expectorant with powerful antimicrobial properties, and when vaporised, Star Anise oil has a clearing action on the respiratory system. It also gives an uplifting and strengthening boost to flagging emotions. Anise star as a herb has been used in traditional Chinese medicine for thousands of years to promote vitality and strength, to aid digestion, and also as a diuretic. Essential oil of anise star has these same qualities plus effective antibacterial and anti-fungal properties. The essential oil is obtained by steam distillation of the partly dried or freshly picked fruits.